Welcome to the website of Bethany Gospel Chapel in Hamilton, Ontario. 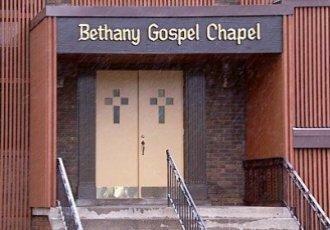 Bethany is a small yet vibrant church near the intersection of Barton Street and Gage Avenue. The congregation is made up of a number of people from different countries who speak various languages and have a variety of interests. We are very involved in our neighbourhood. Several individuals from Bethany volunteer at local schools in a variety of exciting ways. To find out more about what makes Bethany unique, click here to go to our "Bethany is..." page. On the fourth Sunday of each month, our services are different. We meet at 10:30 for a combined service that includes worship, communion and teaching. Nursery and Sunday School are available during this service. Starting in April, there will be no coffee served on the fourth Sunday of the month.